I charged straight into a positive punishment scenario by accident recently. I’ve been somewhat in the training doldrums lately, probably because I am putting so much energy into finishing my book. I have several training activities that I fall back on when I don’t have much energy. They are fairly unchallenging for me (read: I can’t mess them up too badly) but still fun for the dogs. Even those have been hard to do lately. But the other day I had some time and energy and decided to play a shaping game with each dog. We don’t shape that often, but they all enjoy it, and it gives their minds a good challenge. So I decided to set up an object interaction session again. I set out a target stick, a plastic lidded box, and a laundry basket with a plastic dumbbell in it. I put the plastic box on top of one of their mats so it wouldn’t skid around. I had an idea of a behavior for each dog, but was also willing to decide on the fly if someone did something unexpected. Clara’s session was easy. The dumbbell in the laundry basket was for her: she loves to pick things up. I stood about 15 feet from the array of objects and it took Clara only a few clicks/treats to get over there. I stayed at a distance. This helps the dogs learn that the reinforcement zone is not always right on me, and also sets me up to practice my treat tossing. It didn’t take much to get Clara over to the basket and looking in. The basket wanted to skid on the floor so I did go over there and brace it, at which time Clara was happy to put her two front feet in. Then I shaped her into picking up the dumbbell. This is normally very easy, but it was a slight challenge with her front end in the basket and back end out. A good time was had by all. Summer is my super-duper shaper, which is interesting since she is my crossover dog. Crossover dogs are often reluctant to offer behaviors, but what can I say? Summer got over it. And turned out to be a creative genius when it came to thinking up stuff to do. But this session didn’t require a virtuoso performance. I shaped her to go to the target stick, which I had put behind the other stuff. She still got to it in a minimum of clicks. I needed to make more of a challenge, so I put the stick in the laundry basket with the dumbbell. She needed to hop in the basket to nudge the stick, and that she did. She’s great about getting in things. Zani’s Shaping Session: Punishment Happened! You knew it would be Zani, right? My easy dog/problem child. So I had intended the plastic box for her. She’s done quite a bit of perch work and enjoys it. No big deal. 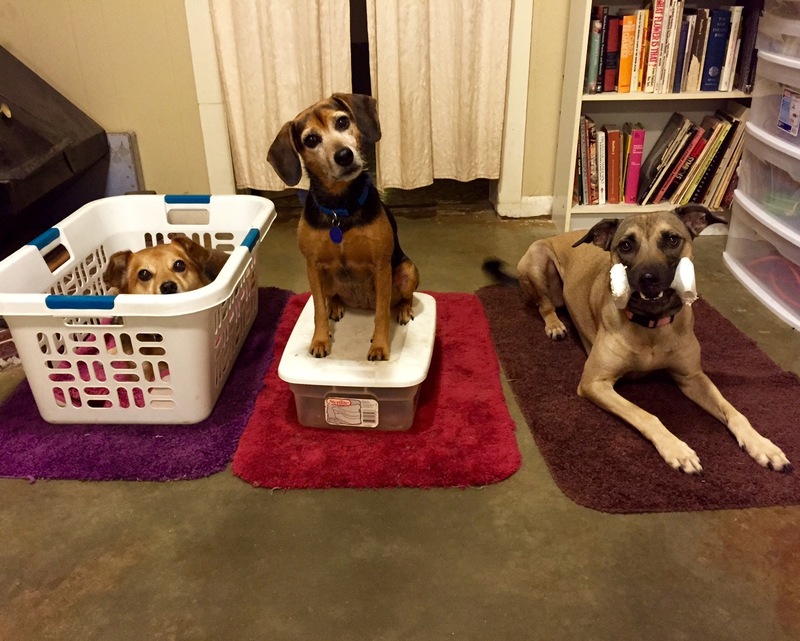 We messed around a bit: she investigated the target stick and the laundry basket. Finally she noticed the box. She was directly facing me, with the box between us, and put her two front feet up on it. Yay! Click, toss the treat. Then she got on again! Ditto. On the third time, I had a sudden thought to treat in position rather than tossing the treat to reset her. So as she was placing her feet on the box, I charged right over there straight at her. She’s my pressure sensitive dog. She backed off the box in shock and scooted backwards, though she did collect the treat I had hastily thrown. I retreated back to my area, but would she approach the box again? Nooooo. So I quickly went back to rewarding other behaviors. About 15 treats later, she was willing to go to the box again. I didn’t charge at her. It took about 5 more treats to get her putting her feet on the box. OK, here we go. We could do at least two different analyses, because not only did a behavior decrease with positive punishment, but a behavior increased/maintained as a result of my aversive high speed approach too! I’ll leave that one as an exercise for interested commenters. Let’s go over the punishment. Did the behavior decrease? Oh yeah it did! Zani loves to get on things and has been reinforced plenty for it. She had just gotten in the groove of offering “box” behaviors but stopped offering them after I charged at her and didn’t interact with the box again for quite a while. That’s a decrease. There was also a decrease in her behavior in general. She got tentative and ever so slightly shut down after my barging into her space. Why is it called “positive” punishment? Remember that positive and negative in operant learning terminology refer to whether a stimulus is added or taken away. In this case Eileen charging at Zani was an added stimulus. Positive punishment is the learning process that we pretty much try to avoid at all costs. So how hard should I be knocking my head against the wall? As usual, we ask the dog, and we do this by observing her response. Did we see side effects? Referring to the list on my post “7 Effects of Punishment,” we probably got small doses of # 1, avoidance, and #4, apathy. It remains to be seen whether we will see any avoidance of me outside of training, but I could easily see her getting sensitized about my approaching her. During the session I saw a decrease in behavior from her in general, which could fit under #4. Luckily, this was only over a brief period. Zani started offering behaviors again, and then was getting back on the box willingly (i.e., no pressure from me) within about two minutes. Susan Friedman points out that when an animal has a large reinforcement history and “trust account,” the animal can typically handle life’s little unpleasantnesses well. So this probably wasn’t a horrendous tragedy. On the other hand, I have worked very hard to pair my approaching and entering Zani’s space with good stuff since she is sensitive to body pressure. We play games where I invite her to enter my own space as well, especially when I am standing up directly facing her. That’s just hard for her, polite little dog that she is. So chalking up another “Eileen is a boorish clod and she scares me sometimes” experience was not ideal. Even just that one time may set us back just a bit in the work I do to make her comfortable with me. In other words, there is a good chance that there is some fallout of the avoidance type, though it may be subtle. The side effects of punishment listed are generally overt behaviors. There’s also the basic issue that it can scare or hurt an animal. Whatever the animal’s behavioral response, that’s not a good thing. So how to think about this? I don’t think being alarmist is helpful. Yes, I punished my dog, but it’s over and done with and wasn’t a tragedy (even from Zani’s point of view, I’m pretty sure, which is the one that counts). But neither do I think this is the kind of thing to brush off. It set us back just a little bit. Zani might be a little extra wary with me in certain situations for a while. I’ll have to work that much harder to make approaching her in various ways into a happy thing. Accidentally running up in my dog’s face is not something most people would design as a deliberate punishment. People who do use positive punishment in training would probably be amused that I am even classifying it as such. But one of my points is that even such a benign-sounding action can have fallout. Why use punishment to decrease one behavior when it will simultaneously create problems with others? You are left always trying to fill a leaky jug. And Zani, though sensitive, has a pretty solid temperament and is used to my ways. What if I had been working with a fearful dog or even one who was new to me? A mishap like this could have meant a setback of days or weeks. Anyone want to share their own accidents? I’m not asking for true confessions about deliberate aversive use. Plenty of us have those in our histories. Let’s talk about that another time. I’m more interested in the boo-boos. I bet I’m not the only one….